The current organic marketing frenzy promotes "wholesome" and "unprocessed" as health benefits to consumers seeking a "natural food product." But when it comes to unpasteurized raw milk, "buyer beware" might be a better slogan. That&apos;s a lesson learned the hard way by the residents of northern California&apos;s Del Norte County, where public health officials are investigating the incidence of illness in 115 families who drank raw milk from the Alexandre Family EcoDairy Farms. The farm owners have since ended their raw milk sales, available through a "cow share" program, following a series of reported campylobacter infections that caused serious illness. In one case, the raw-milk-linked illness resulted in paralysis when a woman developed a form of Guillain-Barré syndrome. According to Valente B. Alvarez, professor in food science and technology at the Ohio State University College of Food, Agricultural, and Environmental Sciences, it is illegal to sell unpasteurized milk in 24 of the 50 states, plus Puerto Rico. Nonetheless, many states do permit the sale of raw milk to the public through the selling of "shares" in a dairy cow, at the farm where it is produced, or in retail outlets. One owner of Alexandre Family EcoDairy Farms said people who participate in his cow share are first given a "three-ring binder full of information on the risks" and, despite the dangers, "come begging for it." But Alvarez said care must be taken. "&apos;Unprocessed&apos; in this case is not a valid claim for &apos;better,&apos; and there is overwhelming scientific evidence that anecdotal claims of health benefits do not outweigh the risks," he cautioned. But he concedes that each individual is a case study of one and that there is varying immunity, depending on age and health status. Partisans of raw milk also cite the need for vigilance. "I can&apos;t stress strongly enough that the health of the cows, how they&apos;re fed, (green grass or starchy grains), where they&apos;re confined (pasture or manure-laden pen) and how the milk is collected all contribute to the safety of the finished product," writes Randolph Jonsson, the Webmaster at raw-milk-facts.com. While raw milk coming directly from the udder of the cow does have beneficial microbes, once it leaves the bovine body the chance of contamination, Alvarez said, is very high. Even in state-of-the-art milking parlors, there is a significant difference, when it comes to bacteria, between sanitizing and sterilizing the milking equipment. In no more than a few minutes, as milk leaves the udder, it may come into contact with bacteria from the animal&apos;s teat or with miniscule amounts of "clean but not sterilized equipment," and the bacteria can multiply to exponential levels, making the milk unsafe. The process accelerates in warm climates. Still, some believe the naturally occurring microbes are beneficial. But they may not have done all the necessary homework. A fact sheet by Alvarez and Francisco Parada-Rabell cites 10 potentially serious bacterial contaminants that may be present. 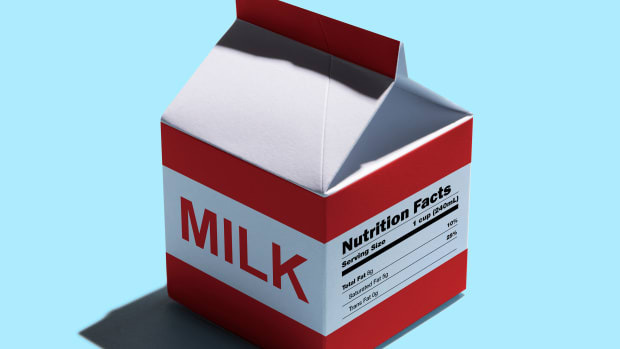 On the other hand, pasteurization, the process of heating milk for 30 seconds to less than one minute at varying high temperatures, does not break down proteins but makes them more digestible, and it does not affect the important fat-soluble or B-complex vitamins. Partisans, however, say pasteurization also destroys valuable bacteria, like the anti-food poisoning bacteria found in feta made from raw milk. So raw milk seems to have a permanent market. A recent issue of Wine Spectator, in a special report on the 100 best cheeses, identifies a significant number of the top-rated products to be made with raw sheep&apos;s, cow&apos;s or goat&apos;s milk. Of course, those raw dairy delights are paired with a recommended wine, not a bowl of Cheerios.